Apples are a great topic for learning adventures this time of year. From the time children are very small to the time they become adults, they sip on apple juice, eat applesauce, and know the wonderful taste of apple slices as a snack. Let’s take off and explore these wonderful creations in a bit more depth. What do you think that David meant when he wrote “Keep me as the apple of your eye”? “Apple of your eye” is used to describe something treasured, or the pupil of an eye. That phrase is known as an idiom, which is a phrase used to describe something in a very unique way. Another example of an idiom is the phrase “a piece of cake”, which means that something is easy. David was asking God to protect him, to keep him safe as God’s treasure. Apples have been mentioned many times throughout history, and the story of William Tell is just one example. Just about 700 years ago, William Tell was punished for not bowing down when the ruler ordered it. As punishment, he was forced to shoot an apple that sat on the head of his young son. Had he missed, he could have hit his son instead. Tell did not miss, and eventually helped Switzerland become a country. Isaac Newton also made history with apples. He was a brilliant man, and developed many ideas on physics and science that helped people learn more about science and math. Now, here’s a question for you. What did apples have to do with Isaac Newton’s discovery of gravity? 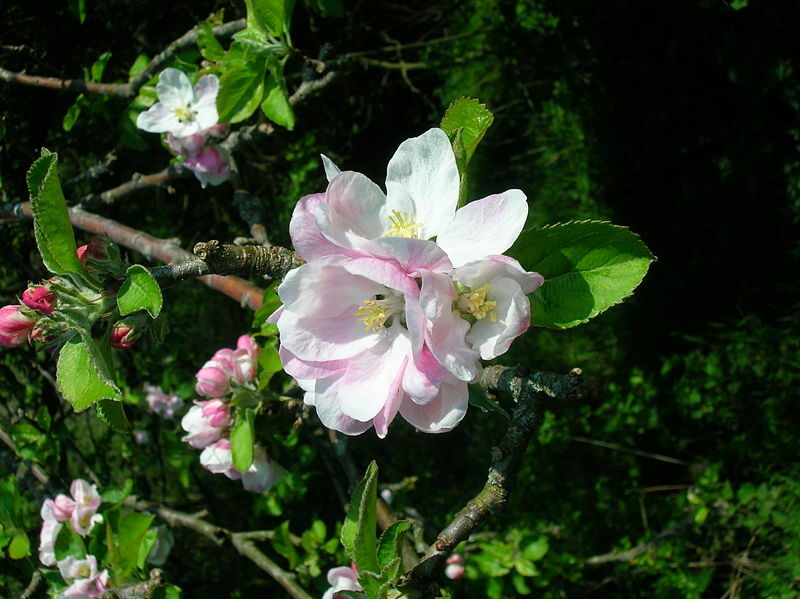 When settlers began coming to America, some of them brought apple trees to plant in the New World. Just before the American Revolutionary War, a baby boy was born to the Chapman family in Massachusetts, and the baby’s father was one of George Washington’s soldiers. The Chapmans named that baby John Chapman, and he grew up to love plants and animals. He started traveling across the American frontier, planting apple trees and spreading the gospel as he went. He eventually came to be called Johnny Appleseed, and he helped America grow west by planting apple trees and sharing his faith. 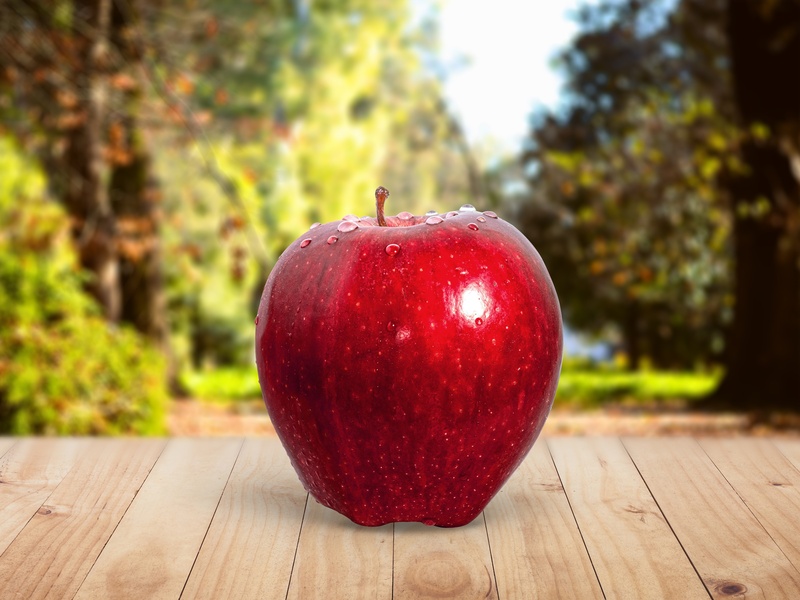 When you look at a juicy red apple in the store, do you know where it comes from? Apples grow on trees, and apple trees are beauties! In the spring, they are covered with flowers, and by the time autumn arrives, the trees are loaded with apples, waiting to be picked. Most Americans love apples and apple products. According to the U.S. Apple Association, the average American eats almost 50 pounds of apples and apple products each year. That’s 10 big five-pound bags of apples per person! Which of the following are some of your favorite apple foods? Fruit: the part of a plant that has seeds and flesh, such as apple or strawberry. Vegetable: a plant or part of a plant, such as carrots, beans, or lettuce, that is used for food. Looking back at the definitions of fruit and vegetable, which fits the apple that you have in your hand? Tempera paint – Red and green are great for this project. 2 paper plates (for the paint). Paper – construction paper or card stock. 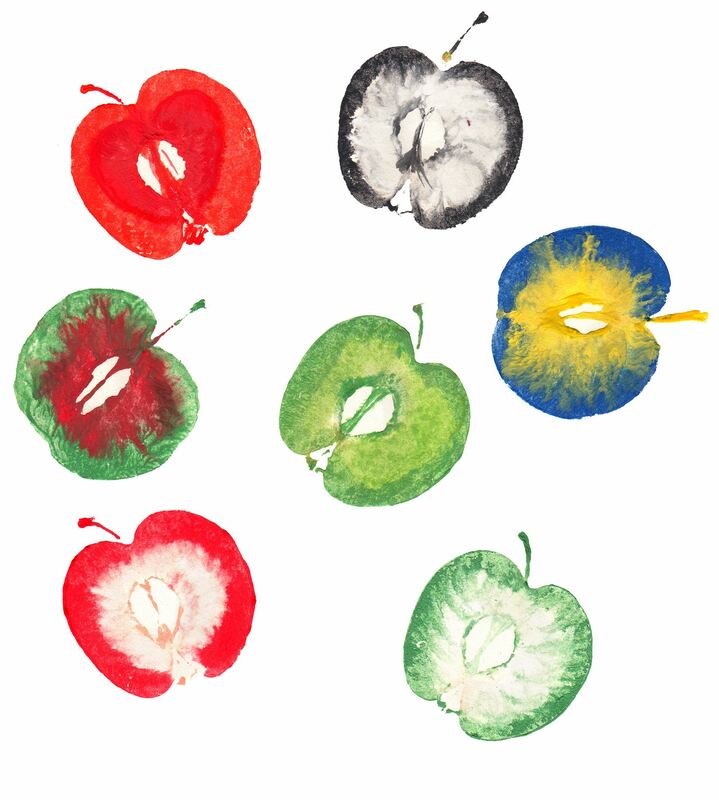 And now, have some fun creating apple prints with your apple halves. If you would like, draw the trunk of a tree or some branches on the paper before you start stamping/printing with your apple pieces. 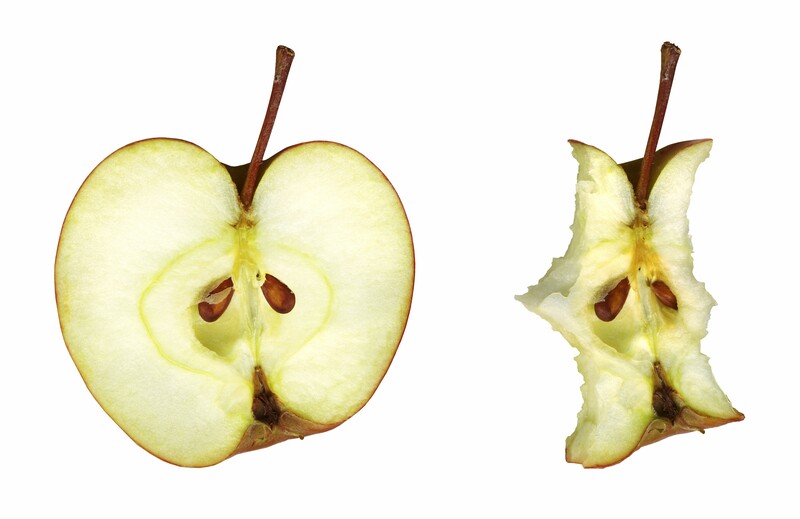 If you have older students, they can be a bit more creative and carve different shapes on the printing side of the apple. When you are finished, leave your artwork in a safe place to dry and remember to sign and date your art. Congratulations on your creation! You learned about idioms in the beginning of this unit when you studied “apple of your eye”. In the English language, there are a few other fun apple idioms that you might recognize. Can you describe what each of the following apple idioms means? Take the whole family to a nearby apple orchard or apple farmers market. If you can find one that has an apple cider press, have fun watching the process and enjoying the apple cider, fresh from the press. Make applesauce in a crockery cooker, and let it simmer and cook through the day as you homeschool. Add some cinnamon if that’s a favorite flavor, and get ready for a delicious dessert. Autumn is a great time to plant an apple tree or two as a family project. In the years to come, you can take the family picture by the apple trees as the kids and the trees grow. US Apple Association—This site includes coloring books, facts, an apple variety guide, and more! 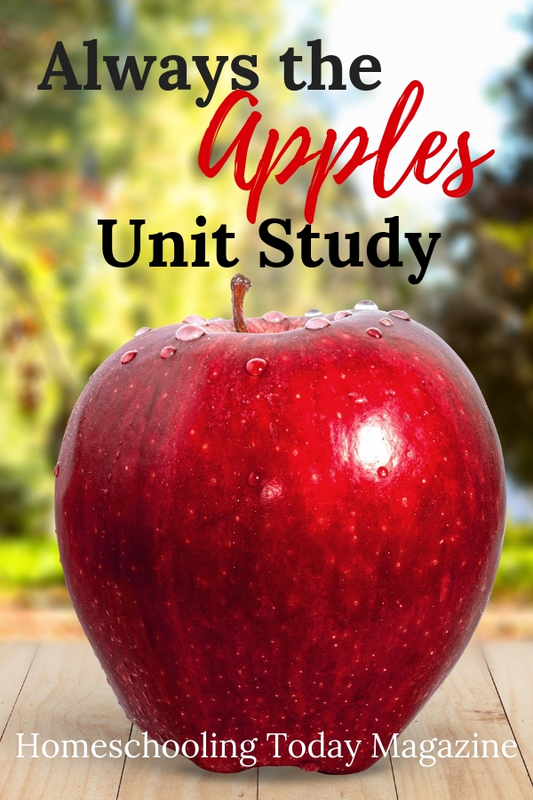 University of Illinois Extension—Find a chart showing the different apple parts, recipes, and more ideas for using apples in your different subjects. Apples to Apples—There are multiple “varieties” of this game to choose from so it’s perfect for the whole family. This article originally appeared in the Summer/Fall 2015 Issue of Homeschooling Today under the title Capturing Curiosity: Apples. Prev 2018 Digital Holiday Edition Facebook Party!